The man I met at Komagata-ya (local bar/izaka-ya) created the character of Hiruta. Not me. In his autobiography, Kurosawa confessed he could not stop writing lines after lines for Hiruta’s character. 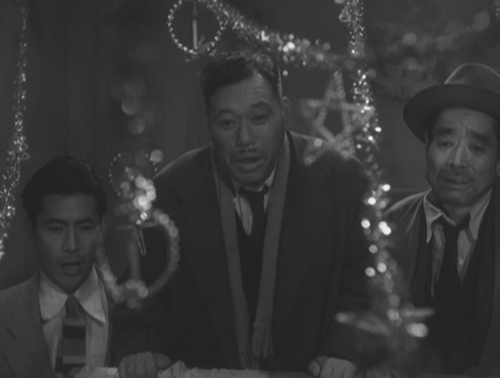 As Kurosawa develops the details out of the promising synopsis on yellow journalism, the character of Hiruta becomes more vivid, more morally defunct, even more pathetic, and more real. After the release of the film “Scandal”, his memory suddenly flashed back to the scene he had forgotten, the night he had met this man. That was when Kurosawa was still a young assistant director, drinking alone in his favorite cheap izakaya one night. Then this old pathetic drunk sat next to him. He was in stupor, trying to strike up the conversation with him, which prompted the shop owner to intervene. 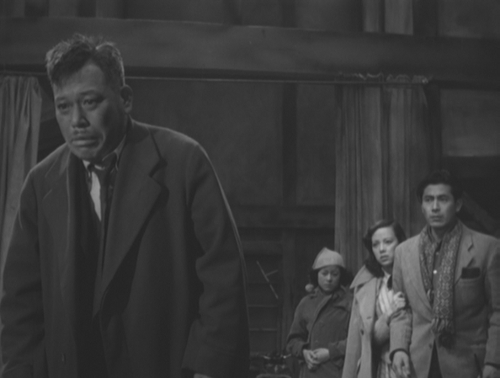 “Hey, you shouldn’t bother a kid.” But Kurosawa let the old man speak. The old drunk kept praising his sick daughter, using tacky phrases like “like a star” or “like an angel”. Then, in turn, he deplored himself as a weak, pathetic, powerless, drunk. This swinging between praise and self-pity went on until the shop owner handed him a pack of food for his sickly daughter, and said “Go home”. The old man went silent, took the food and staggered out the door. This old man made such an impression on Kurosawa. But he completely forgot about him even when he was writing the script for “Scandal”. According to him, this old man had been hiding between furrows in his brain all those years, until the time of “Scandal”, when he jumped out to become the character of Hiruta. Though this may well be a dramatic way of describing his creative process, Kurosawa emphasized that a character as real as this would override any characters manufactured in one’s head. He is so powerful. He drives the narrative. His presence makes the film riveting. Many would agree that Hiruta is one of the earliest fully round character in the Kurosawa’s works. He is sharply contrasted by other characters in the film, most of which are shallow, sometimes bewilderingly non-decrepit, or plain cliched. The idea for this film occurred when Kurosawa saw the advertisement for a magazine in the streetcar. It was a shameless display of sensationalism, making fun of an actual lady, a public figure, in a very suggestive context. He was upset, calling it “violence of free press”. Before and during the war, the press and journalism had been heavily interfered and censored by the government. American occupation had liberated the press, guaranteeing the freedom of expression. But the liberation also let the voyeurism loose and some publishers did whatever they could to pursue profit. The wave of yellow journalism became prevalent. Kurosawa wanted to make a statement about this trend. To express his concern effectively, Kurosawa staged the story in judicial court. In this genre, the idea can be expressed in direct manner without being preachy. Strangely,, in this film, it created cracks in the narrative. The character of Hiruta sneaked into this crack, creating a havoc. The legal process described in this film is almost disintegrating. Hiruta is a corrupt lawyer with no intent of winning. Only thing he studies at all is horse races. The publisher in question pays him a handsome amount of money to cover his gambling, while demanding him to throw the defence out of the window. But this is known only to audience. The characters in the film do not know the setup and believe that Hiruta is either an incompetent consultant, a simple idiot or a person who needs a redemption. In any storytelling, the availability of the truth/information to audience and/or characters in the story is critical in driving the narrative. Sometimes, the characters in the story know the whole picture while the audience don’t. The audience starve for more information or mechanics behind the story, making it more compelling. When the audience are given more information than the characters in the story, all they can do is to wait and see. In “Scandal”, we know what Hiruta is up to all along, but we look at the mess helplessly. In 1950, the year of this film’s release, the experiences with Tokyo Tribunals were still fresh among Japanese people’s minds. There were ranges of sentiments against this trial among Japanese public, from humiliation to uneasiness and, to some, anger. The final delivery by the Judge William F. Webb for the A-class war criminals was openly broadcast. The sentence heard over the radio, “the death by hanging”, sent a shock wave through those who listened to the broadcast. To this day, the justice process in the Tokyo Tribunal and subsequent rebound into anti-communism political atmosphere gather a lot of opinions in Japan. Some believes that the trial was incomplete since it let many war criminals go unquestioned. Some believes the whole process was a circus, as it smells the revenges by the victors.This mistrust stems from the speculation that there must have been some unhealthy motivation to proceed the Tribunal as it did, but it is not entirely clear to us what that motivation was. Many believes critical facts were hidden from the view. The information was not shared with public, only the results were. At one end, the press was given the freedom of expression, abusing its power. At the other end, whole nation was blindfolded from what they should know. 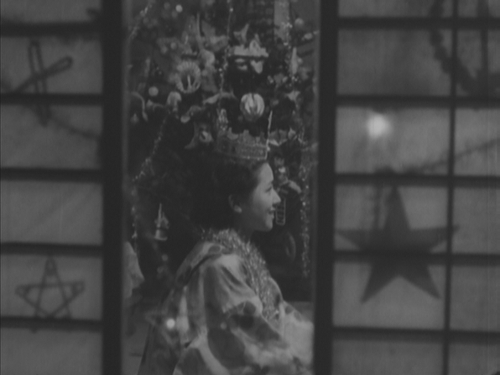 Japanese at the time must have felt like Aoe and Saijo in the film. Interestingly, many Japanese films during the postwar years deal with the loss of fatherhood (father figure) . Examples include, “Yabure-Diako”, “Anjo-ke no Budoukai”, “Ozone-ke no Asa” and others. During the prewar and war years, it was a requirement to show the highest respect to the head of a family. Confucius principle of family structure is the basis for drama of the era, while the idea extended into the society itself. When the nation was at war, the political and military leaders were considered ‘fatherly’ figures, and this tendency was more prevalent in wartime Japan. Tokyo Tribunal was the trial of these figures, who were not fathers of the nation after all. Strange it may seem, the loss of spiritual fathers prompted many Japanese to look for a substitute in Allied Forces/SCAP, especially (believe it or not) in Douglas MacArthur. But, of course, SCAP was not interested in playing that role but they were rather in suppressing social movement (as a part of Cold War politics) and forcing stringent national budget. Japan has lost its spiritual father. At the beginning of the trial, Hiruta was laughed at by on-lookers at court when he appeared in anachronistic attire used in prewar Imperial Japanese Court. I wonder what he had been doing during the prewar and war years. Was he a compatriot? Did he push younger generations to war field? What was he like? What made him so bitter and so indifferent? That’s what ‘real’ characters do to the audience. They force us to wonder what they do outside of the screen. That’s what the ‘reality’ is like. We think we know, but we don’t have all the information. There’s more than we have seen. Or is it possible, we fool ourselves to believe we know anything about anything without distorting it?